The District is set to usher in the Year of the Pig on Saturday, Feb. 2 with a lucky red envelope giveaway, lion dance performances and more. Beginning at noon Saturday, Feb. 2, the first 500 guests will receive a lucky red envelope containing a crisp $1 bill, a tradition that symbolizes good fortune for the coming year. 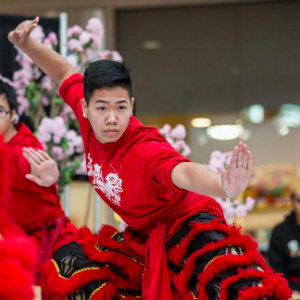 Highlights of the event will also include lively lion dance performances at 12:15 p.m. and 1:15 p.m., along with fan dancers and plenty of kid-friendly activities. 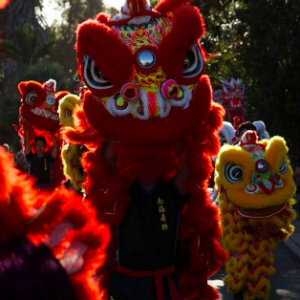 The lion dancers will begin their spirited performances outside AMC Tustin 14 and make their way to Union Market Tustin, stopping along the way to “gobble up” lucky red envelopes from participating shops and stores – and any families that want to join in on the interactive lion dance action, too. photo backdrop, too. Children can also enjoy several activity stations, including watercolor painting, color-your-own dragon, and create-your-own paper pig crafts, along with face painters and balloon artists offering dragon or pig-themed designs and creations. The entire event is free to the public. Jasper Plum will be giving away lucky red envelopes filled with vouchers good for up to 50-percent off your total purchase; red envelopes will be given to the first 50 customers on a first-come, first-served basis on Saturday 2/2. Ritz Nails will be inviting all of its customers to select a lucky red envelope after their service and receive $1, $2, $5 or 20- percent off coupons inside their envelopes. Additionally, any customer who says “Happy Lunar New Year” from 2/5 to 2/7 will receive a free nail design. All Coco inside Union Market will be offering all customers who say “Happy Lunar New Year” a free small scoop of ice cream. Offer valid only on 2/2. BubblePOP will offer 50-percent off admission for adults on 2/5. The Halal Guys will offer a free order of fries with every platter or sandwich purchase. Offer valid 2/2 to 2/10.